I read around. I don’t care who the author is, where the story takes place, how many characters there are or even the age level of the book. Paper, electronic, audio, or even film adaptations... I’m shameless! I have to admit that the cover art intrigued me while browsing the Kindle store. The spaceship over the pyramid reminded me of one of my favorite movies and TV series, Stargate. This was nothing like Stargate, but it wasn’t bad. I'm not too familiar with Indian religion, mythology or culture and had to Google a few things to get the back story of some of the characters. The plot was intriguing enough to hold me in and to make me want to learn more about it. It was a fun, fast, and educational read! This story was absolutely fabulous! It's been on my to-read list for quite a while. It wasn't until my son brought it up a few days ago that he really liked the story and wanted to see the movie that I pulled if off our shelf and started reading it. After that, my son and I watched the movie and enjoyed the heck out of that too! My favorite part of the book was when Coralline was telling the black cat a story about her and her father taking a walk and they came upon a wasp nest. Her father told her to run while he stayed behind to distract the wasps from chasing her until she was far enough a way. For some reason that brief anecdote from her life really struck me. It is nothing I wouldn't do for my own children' but it stood out in this story as a beacon of how much her parents really did love her no matter how much they were involved with their careers and other adult stuff. I picked up this book because I heard there was time travel in it and it was very highly rated. I was disappointed that it turned out to be a mushy romance instead. I made it through the first 100 pages or so, just waiting for something exciting to happen. 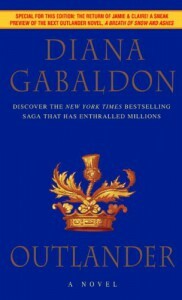 I could see that the main battles being fought in this book were Claire's internal battles as she adjusts to being thrown into a different time and finds herself falling in love with a wild, young, handsome Scot, even though she had a husband back in her original time. This just wasn't my type of book. Should I give it another chance? Does it get any better or does it just focus on romance? I knew about the Fables series by Bill Willingham but never picked any up, not being a huge fan of graphic novels. My disclaimer: there is nothing wrong with graphic novels; I love the art and stories and appreciate the talent that goes into creating them, but just never got into them so much. So, when I learned that there was a book that takes place in the same world, I decided to try it. The Fable characters in this book are from fairytales, nursery rhymes, and other fabulous fictional worlds.Peter is the famous Peter Piper - yes, the one who picked a pepper and also the one who put his wife in a pumpkin shell. Peter is married to Bo Peep and in reading this book you find out exactly how she lost her sheep. You'll meet the husband of Snow White - not Prince Charming - and find out that her sister Rose Red drives a Range Rover. Now, I have been a fan of Grimm's fairy tales ever since the elementary school librarians, tired of trying to keep me corralled in the picture book section, finally allowed me to choose books from the "older" section of the library. I was not disappointed in the story of Peter and Max. Willingham pulled these fairytale and nursery rhyme characters into the present with great success. It could have been a modern-day Grimm's fairy tale. Kudos to you Bill Willingham! The second book in the series started off right where the first left off. The factions are at war and Tris is caught up in the middle of it. The secret that she is Divergent is out and she finds that she isn't as alone as she thought. As she continues her quest to find out what is so important about being divergent she faces some very important decisions and must learn to trust those she thought she shouldn't. Tris is a very strong minded character who doesnt let her love interest affect what she thinks is right. She follows her gut feelings even though it may mean the end of her relationship with Tobias. This book ended as a cliff hanger and it successfully left me wanting more. I am waiting to get my hands on the third installment. This book was recommended to me by a friend. I hesitated picking it up for a while because, knowing that it was a YA book set in a dystopian Chicago, I thought it would be filled with pages and pages of teen angst. Ok, so there was some teen angst, but there wasn't so much that it distracted the reader from the focus of the story. In a world where you choose a community to live in based on your personality, having an open mind, split personality - or what they call Divergent - is a dangerous thing. Beatrice, born in raised in the Abnegation faction (selflessness) decides to transfer to the Dauntless (brave or tough) faction when all 16 year-olds are forced to chose which faction they will spend the rest of their lives in. Before they choose, they undergo testing to help them decide which faction would best suit them. Beatrice learned at her testing that she was in fact Divergent - showing signs of having strong traits from more than one faction. Luckily for Beatrice, the instructor who conducted the testing was a Divergent sympathizer so fudged the test results to hide the truth. Not knowing why being divergent was dangerous, Beatrice tries to fit in a new faction without letting out her secret. Beatrice proves herself in her new faction, but she's finding it harder and harder to hide the fact that she is divergent. In trying to find out why Divergents are considered dangerous, she finds herself mixed up in a war between factions for the power of the city. I enjoyed reading this and look forward to finding out what happens next, in Insurgent. I can describe William Shakespeare’s Star Wars in one word – Hilarious! The first thing I did when I opened this book was to scan through the pages looking for the famous lines. I was not disappointed. It was such a fun read. Five stars! This book spent many nights on my bedside table. Not because it was an epically long book, it was quite short actually; but because I just couldn't immerse myself into it. It seemed distant and shallow, almost ethereal. It was like only half the story was being told but yet there were so many things going on. I found it hard to stay interested in it. First of all there was the main storyline about the flu epidemic that the main character, Lydia, was experiencing. After each chapter from Lydia's point of view, there were newspaper articles regarding the epidemic, then disembodied voices. I assume these voices were people she overheard or something. Then there was the story of a stolen recipe told in letters and more articles. Throughout the main storyline there were marginal notes seemingly from heaven? Overall, it was mildly interesting, and strangely done. The storyline of "The Long Earth" was fairly simple, but the underlying meaning of it was as deep and infinite as you can imagine. The concept that there could be parallel earths and what that really means actually kept me up at night. Just thinking about the possibilities... The problems... The reason I loved this book so much is because my imagination went way beyond the story that was written. That and I can relate to a lot of the steppers in this book - I would leap at the chance to leave the hustle and bustle of the crowded, chaotic society we live in and be able to start all over again. That would be just about perfect wouldn't it? But in this story there are some people who can't step to the other worlds as easily as others can. As you would imagine, this creates jealousy and resentment and ultimately, hate. Spoiler alert: it ends with a cliff hanger! Dr. Spencer Black spent his childhood grave robbing with his father to help supply the local med school with specimen to practice on. Naturally, he went on to medical school himself when he grew up. He became a great doctor who specialized in the mutated growth of human beings. Sometime during his practice he began to suspect that they weren't mutations after all but residual genes from animals we all thought were mythical. To prove his theory, he started on a dark path of secret surgeries, manipulation, and insanity. The last half of the book are Dr. Black's anatomical drawings - amazingly detailed - of the creatures he is convinced are not mythical, including harpies, minotaurs, dragons, etc. While reading this book, I kept thinking that it would make a great History Channel documentary. Tom Waits would be the perfect guy to create a soundtrack for it. When I showed this book to my teenaged children, their reactions were priceless. My daughter said, "So Momo just runs and hides? That's so adorable!" Then they started looking through the book; all I heard was "Found him!" "Found Him!" "Oh my God, this is so CUTE!" "There he IS!" My daughter actually screamed when she saw the second to the last page where Momo is laying on his back getting a belly rub. "This is... Oh my God, it's so cute, I can't... Oh, look at him!" We have a dog, Eddie, that is part Border Collie and he looks just like Momo, except Eddie is tan. My kids compared what Momo was doing in the photos to what Eddie would be doing instead; Eddie isn't nearly as patient as Momo seems to be. This was a fun book to look at and enjoy with the kids. It's perfect for any age to enjoy. Eleven year old twin brother and sister, Nick and Tesla, are sent to live with their crazy Uncle Newt while their parents are off on an agricultural mission on the other side of the world. The children know that they are in for an "interesting" time when they realize that their Uncle Newt forgot to pick them up from the airport. After taking a taxi to Uncle Newts house, the children are greeted with a remote-controlled lawnmower that has gotten out of control and has mowed over the neighbor's flower gardens. They proceed into the house and find out why Uncle Newt wasn't at the airport to pick them up... He was glued securely to the floor of his laboratory. As the story progresses there are hints that make the twins start thinking that their parents are more than agricultural scientists, but there is another mystery unfolding right in the neighborhood that grabs their attention. Why are there big, mean dogs at the vacant house? Why is that black SUV following them? What sets this story apart from other young reader mysteries is that this one includes science! Newt's laboratory has a massive inventory of all sorts of pieces and parts to spark the imaginations of Nick and Tesla, and they have been given permission to explore to their hearts content. During the story, they build a rocket, a dog distractor, a tracking device and more. Not only do they build them, but the book includes step-by-step instructions on how to build them yourself! This book, and the included science experiments would be great for 4th-6th grade kids who like mysteries and/or science! Even though I didn't try the science experiments, it was still a quick and fun read for the um, ahem, older generations as well!